VILLAS AND APARTMENTS TO RENT IN CLUB CORTILE RESORT, ORLANDO, FLORIDA. 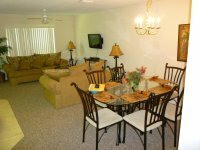 Welcome to our selection of holiday homes to rent in Club Cortile Resort, Orlando, Florida. Club Cortile Resort is a community of condos and townhomes with a Tuscany theme club house overlooking an attractive lake. The club house has a fitness centre, movie theatre, computer room and kitchen, next door is a whirlpool spa and swimming pool as well as a childrens play area. All the major theme parks and attractions are just minutes away as are a selection of fine golf courses. Nearby along highway 192 are numerous shops and restaurants. Looking for self catering holiday accommodation in Club Cortile Resort? Then below is a selection of apartments in Club Cortile Resort, condos and villas in Club Cortile Resort that can be rented direct from their owners. You can either click on each listing for further details or you can use our search engine on the left if you are looking for something in particular.